Midtown Evacuation Center, in the midst of the Triceraton Invasion. 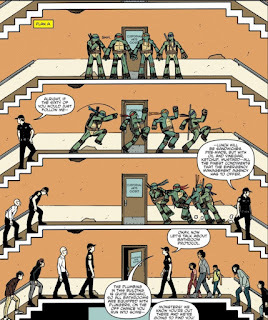 The Turtles decide to duck for cover in what they think is an abandoned building, only to find that it is the evacuation center with the relief efforts being spearheaded by Detective Kara Lewis. A pair of kids see "the monsters" hiding in the shadows and, thinking them the same as "the dinosaur men" attacking the city, resolve to capture the monsters. The Turtles, meanwhile, try to come up with a means to get out of the building without blowing their cover. However, no access but the front doors are available and everywhere they go, the kids are hot on their trail. Det. Lewis, getting suspicious that she may be familiar with "the monsters", orders the other police to keep an eye open for them. Michelangelo eventually comes up with a plan to use the monster-thing to their advantage and the Turtles dress up in unconvincing monster costumes. Throwing a smokebomb, they scare most of the evacuees away on their march to the exit, but are attacked by the two kids. After a tussle, Raphael frightens the kids off, but Mikey makes it okay by telling the kids that they were brave and defeated his fellow monsters fair and square. 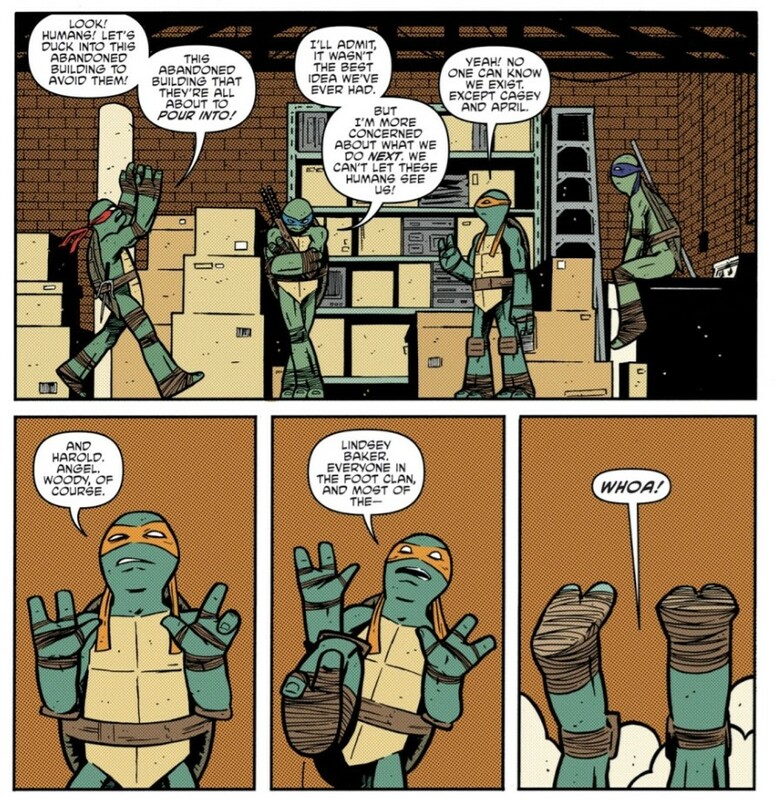 Escaping to a nearby roof, Raph tries to tell Mikey what a solid plan he had, but Mikey reveals it was all a gag to make Raph wear a silly costume and make a fool of himself. They fight. Back inside the Evacuation Center, the kids are reunited with their mother and they feel all the braver for "protecting" everyone. Det. Lewis has a sketch artist draw up the monsters as per the descriptions from the children and, despite the stupid costumes, recognizes them as the Turtles she keeps running into. At Mutanimals HQ, Pigeon Pete has breakfast with an unseen individual. Herman the Hermit Crab and Mondo Gecko come in later, each trying to cheer the individual up. Old Hob then comes in and promises to not only get the materials they need to make the individual whole again, but to make Agent Bishop pay for what he's done. 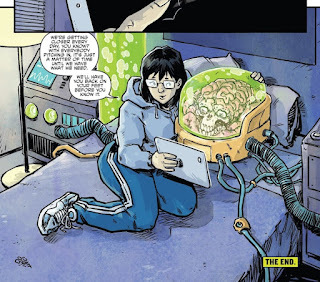 Lindsey then comes in and the unseen individual is revealed to be the disembodied head/brain of Mutagen Man. Together, they binge watch some television and she promises that as soon as they get the resources they need, she'll have him back together again. *This issue is continued from TMNT Universe #17. 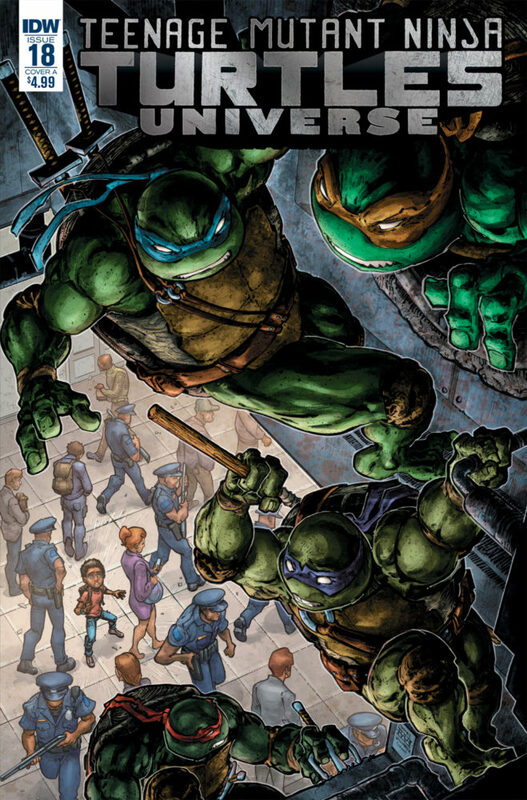 The series continues with a new story in TMNT Universe #19. *This story takes place between TMNT (IDW) #77 and TMNT (IDW) #78. 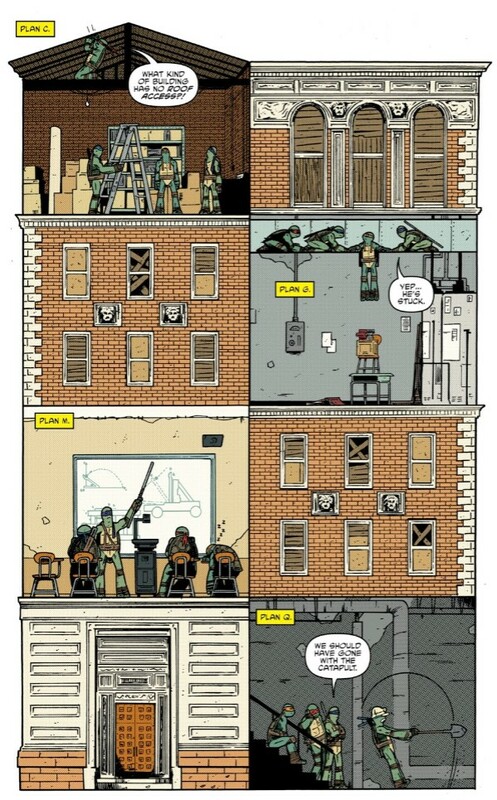 *The back-up is something of an epilogue to TMNT (IDW) #70, but could really take place anytime after that. *Speaking of the back-up, they spell it "Maitenance" on both the credits page and the story itself, so I dunno if that's a spelling error or intentional. *This issue was originally published with 3 variant covers: Cover A by Freddie E. Williams II and Jeremy Colwell, Cover B by Tyler Boss, and Incentive Cover by Ron Chan. Alright, I can tell that this one-shot story is probably going to be divisive among readers, but this is the sort of thing I really enjoy. I mean, not all the time, but light-hearted "breather" stories like this amidst dense drama and serialized arcs are refreshing; even more so when the writer has fun with the script and the artist does something crazy with the visuals. Paul Allor's script could pass for something from Archie's TMNT Adventures. It isn't juvenile, but it is silly and kid-oriented. The scene where the children try to fight the Turtles with vinegar squirt-guns and plungers is goofy as can be, and is maybe the only part of the issue to traipse close to being "juvenile", but the gags work in harmony with the art and all the humor lands. It doesn't sound like it'd be funny in a dry summary, I know, but it works on the page. 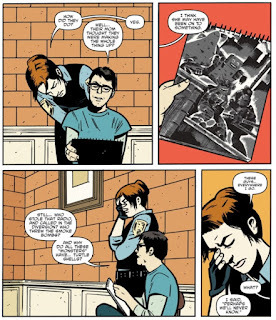 This issue is loaded with pages and half-pages laid out like that and I absolutely adore it. Like I said, I wouldn't want a TMNT comic to look like that all the time, since the style is kind of busy and some pages feel like a game of Where's Waldo?, but as a creative break from the usual every now and again? By all means. The pages that are laid out in a "typical" format, not as some crazy picture book sort of thing, have a good amount of energy to them. And it's interesting that they do, come to think of it. Almost all the non-crazy pages are medium shots, to use a film term, and nothing particularly exciting is done with the perspective. Instead, the characters are nicely expressive (without being overly cartoonish) and there's a certain level of detail that makes each panel feel chaotic even when we're looking at things straight on and soberly. The "medium shot" approach also adds some contrast to the really wild pages I highlighted earlier, creating more emphasis for them. The back-up was a nice, if belated, epilogue to "Desperate Measures". It catches us up on the Mutanimals, who are important characters but have had to take a break since all the OTHER important characters are getting their screentime right now. It did make me think, though. In my last review, and a few before that, I suggested that the back-ups haven't contributed much and I'd like to see them dropped; either to reduce the cost of the book or to have the 4 extra pages given over the main plot. 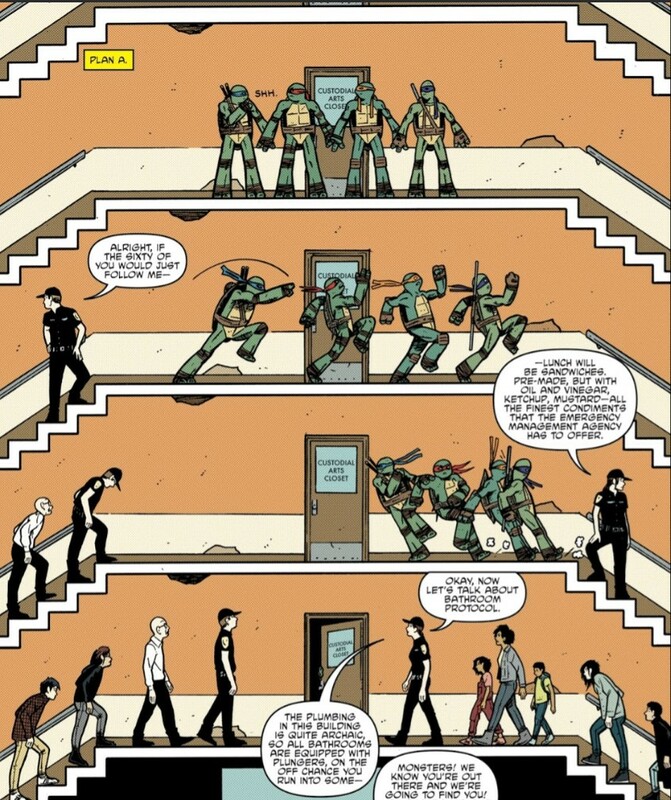 However, since the TMNT universe that this book is titled after is so vast, and many important characters and/or factions have to wait months to years without getting attention because there isn't any room for them, these back-ups might be a good place to keep readers appraised of the goings-on of those sidelined characters on a regular basis. Or at least periodically remind us that they exist. "From the Heart, for the Herd" didn't really do it for me, but this "Monster Hunt" one-shot was a blast. Great art and a fun script. Tonally, it might feel weird sandwiched in the middle of the grim "Invasion of the Triceratons" storyline, but I think it works as a diversion from all the dark and brooding stuff. TMNT can be serious business, but it should still never forget to have a laugh now and again. Interesting. I actually really enjoyed "From the Heart, for the Herd," but didn't care for this story. This issue marked the only time I liked the backup better than the main story, as it's one of the only meaningful backups. 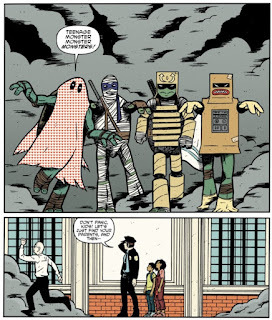 The art style reminds me of Tales of the TMNT #41. I even checked if it was the same guy (it's not). Glad you're finally caught up! Yeah, you hit the nail on the head. Monster Hunt was fun, and Mutagen Maintenance was actually a good backup story. The layouts for Monster Hunt reminded me of stealth video games, or at least the 2D era of stealth games, and I found this refreshing because in a story about ninjas, it's nice to see them practice being ninjas—not just inform that they sneak around without getting seen, but showing us scenarios of how they actually pull it off. It was really nice. You're right that story after story with maps like these might not always be appropriate, but it was appropriate this time. 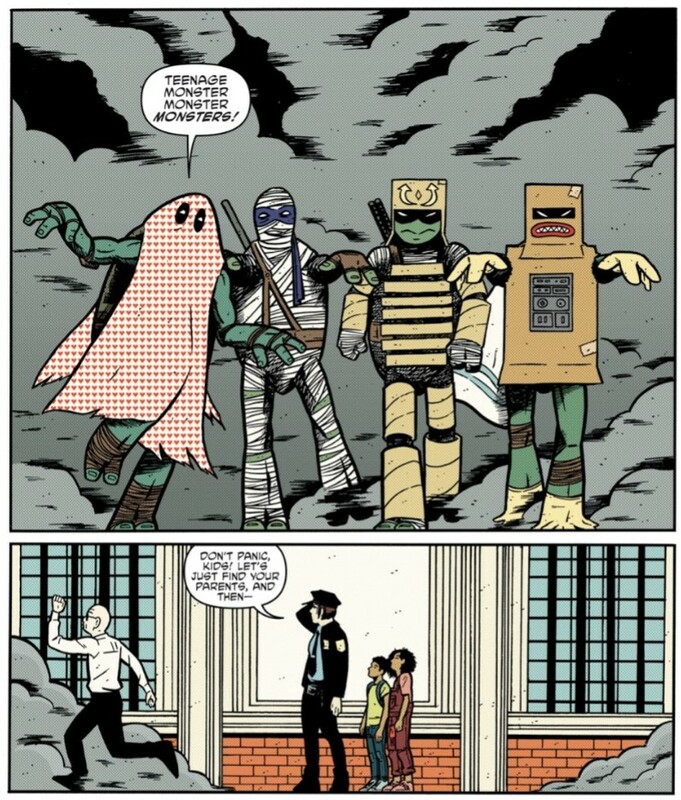 As for the turtles themselves, I noticed in this story that they've been drawn and scripted to act much more like their 2012 TV series versions. Not that Mikey has freckles or Donnie has a gap tooth or any of them has six toes, etc., but their relative proportions and silhouettes are strikingly similar to their 2012 versions, and even their banter reminds me more of their interpersonal character dynamic in that series. And Mikey trying to count with his fingers and toes while still standing up and then falling down when he runs out of legs to stand on? 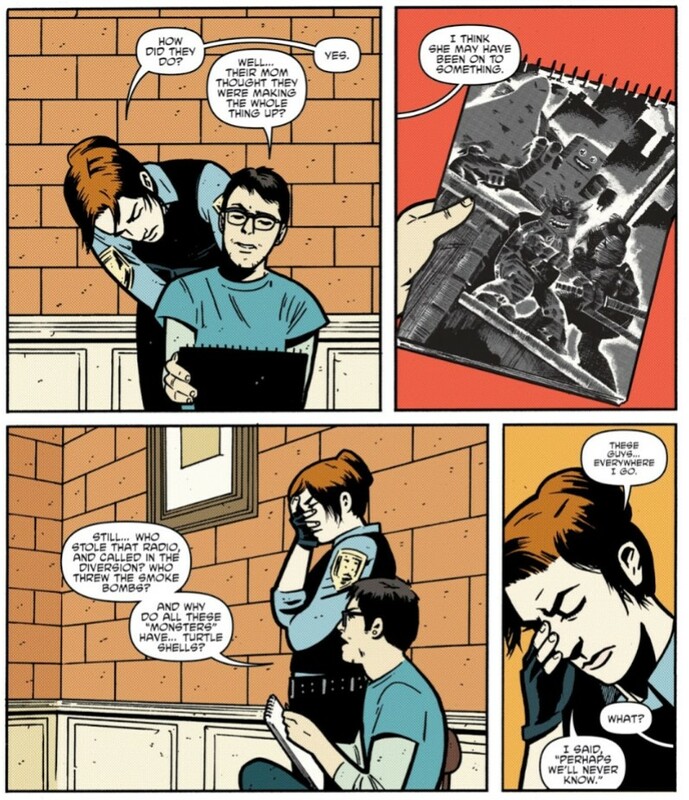 It's hard to imagine any version of Mikey doing that before the 2012 series version. I wonder how many other readers have also noticed these things. "This short, four-page comic is both beautiful and haunting, simultaneously actively inspiring and implicitly despairing. 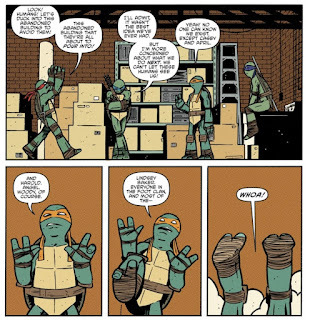 It's a story written with genuine heart and soul, accepting both the happy and the sad while shepherding forward, and that's precisely the kind of TMNT storytelling that moves me the most." Perhaps you could review the Gizmo series in the near future?